Under General Data Protection Regulations from 25-May-2018, this privacy notice explains how Alchemy Medical Writing Ltd uses any personal information we collect about you. Section 1 – What personal information do we collect about you? We collect the information necessary to conduct freelance medical writing services. This information includes your name and contact details. Section 2 – Where do we collect personal information about you from? Directly from you. This is information you provide while searching for a freelance medical writing services (for example your email address) and/or when we approach you regarding possible opportunities. This could be during telephone conversations, face to face or via an email exchange. By explicitly providing consent when you engage in discussions, you are providing permission for our storage of this information. Alchemy Medical Writing Ltd will never share personal information with a third party without your explicit consent. By reference or word of mouth. For example, you may be recommended by a friend or former colleague. Section 3 – How do we use your personal information? We use your personal data to provide a requested service. 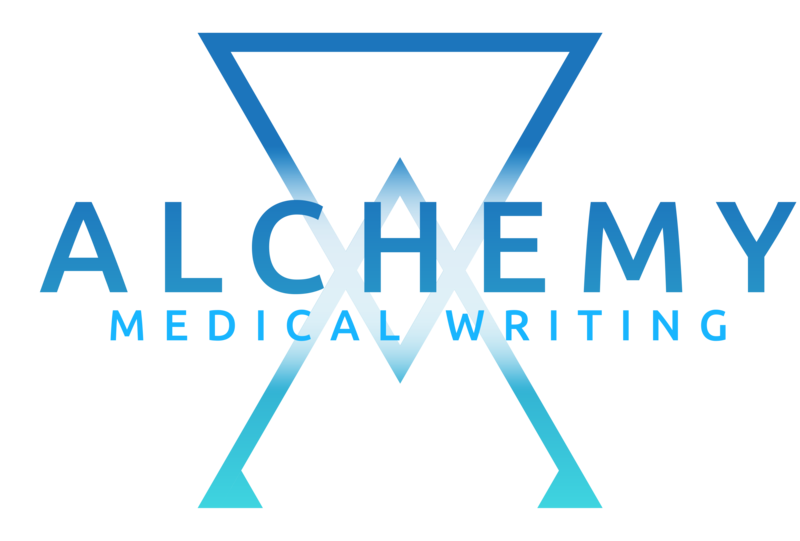 If you contact us to enquire about our services you are giving your consent to Alchemy Medical Writing Ltd processing your email and the data contained within your email or contact form for lawful purposes, as per Section 2 above. We will not share your information with any third party without your explicit consent. Section 4 – How long do we keep your personal information for? Client data: Due to the nature of freelance medical writing, we expect several clients will reconnect with our organisation periodically. For this reason, your consent includes explicit consent to retain your personal details for a period of ten years from the date of the last contact, or until such time as you wish us to delete your records from our database or refrain from further engagement. Section 5 – Who do we share your personal information with? We may share your personal information with third parties who perform functions on our behalf and who also provide services to us, such as sub-contracted medical writers or IT consultants carrying out testing and development work on our IT systems. These third parties comply with similar and equally stringent undertakings of privacy and confidentiality. As we continue to develop our business, we may sell or purchase assets. If another entity acquires us or merges with us your personal information will be disclosed to such entity. Also, if any bankruptcy or reorganisation proceeding is brought by or against us, all such information will be considered an asset of ours and as such it is possible they will be sold or transferred to third parties. Where required we share your personal information with third parties to comply with a legal obligation; when we believe in good faith that an applicable law requires it; at the request of governmental authorities conducting an investigation; to verify or enforce any applicable policies; to detect and protect against fraud, or any technical or security vulnerabilities; to respond to an emergency; or otherwise to protect the rights, property, safety, or security of third parties, visitors to the our website, our business or the public. Alchemy Medical Writing Ltd uses DropBox to store personal information. Any data hosted by DropBox is encrypted and benefits from intrusion detection systems. Section 7 – What happens if you do not provide us with the information we request or ask that we stop processing your information? If you do not provide the personal information necessary or withdraw your consent for the processing of your personal information, where this information is necessary for us to provide medical writing services to you, we may not be able to perform these services. Section 8 – Do we make automated decisions concerning you? Section 9 – What are your rights? By law, you have several rights when it comes to your personal information. Further information and advice about your rights can be obtained from the data protection regulator in your country. The right to object to processing: You have the right to object to certain types of processing, including processing for direct marketing (i.e. if you no longer want to be contacted). The right to be informed: You have the right to be provided with clear, transparent and easily understandable information about how we use your information and your rights. Therefore, we are providing you with the information in this Policy. The right to rectification: You are entitled to have your information corrected if it is inaccurate or incomplete. The right to erasure: This is also known as ‘the right to be forgotten’ and, in simple terms, enables you to request the deletion or removal of your information where there is no compelling reason for us to keep using it. This is not a general right to erasure; there are exceptions. • Baseless or excessive/repeated requests. Section 10 – How will we contact you? We may contact you by phone, email or social media. If you prefer one contact means over another, please just let us know. Section 11 – How can you contact us?